Former President Bill Clinton and former Vice President Walter Mondale were among the many lawmakers and dignitaries present for the unveiling of a statute of Hubert Humphrey Saturday on the State Capitol grounds. 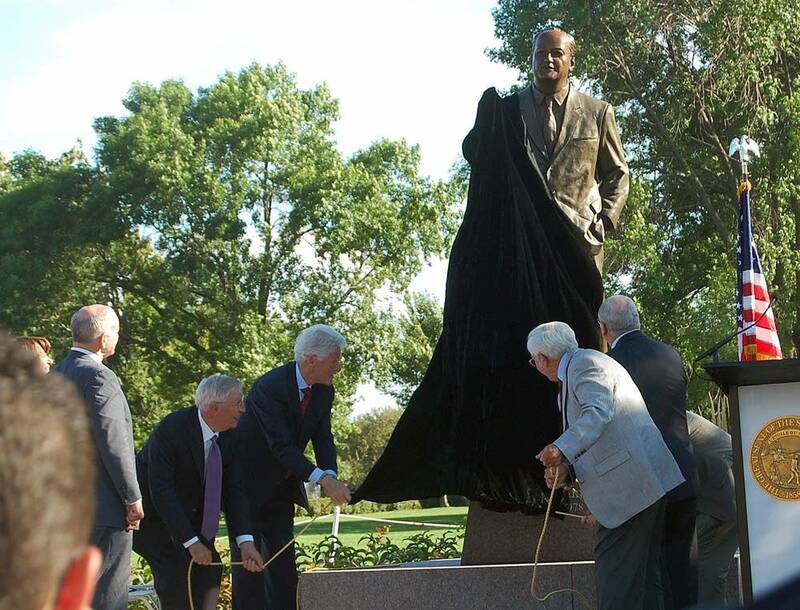 President Clinton and Hubert Humphrey's sons removed a black velvet cloth to reveal a 7-foot-tall statue depicting the former vice president in a suit, one hand tucked in his pocket and the other arm stretched forward. The bronze Humphrey has a finger extended, as if midway through making a point. The expression on the statute's face is friendly, belying Humphrey's history of delivering fiery speeches. His most important one might have been in 1948, to the Democratic National Convention, when Humphrey was mayor of Minneapolis. "There are those who say -- my friends -- to those who say we are rushing this issue of civil rights," he said at the time. "I say we are 172 years late." That same year, Humphrey campaigned for U.S. Senate with help from one of his staffers, Walter Mondale, who would later also be a vice president. As he introduced Clinton, Mondale said Humphrey and the former president from Arkansas shared similar traits. "They both have endless energy, they both know how to give a speech, they are both full of hope and love and decency and optimism -- and that's what we need right now," Mondale said. At the time of Humphrey's speech to the Democratic convention, Clinton was 2 years old. "You have no idea how many times I watched a tape of that speech when I was a boy growing up in Arkansas," Clinton said. "Because I knew that that led directly to the passage of the Civil Rights Act, to the passage of the Voting Rights Act, to the passage of the Housing Rights Act, and, eventually, to the election of Barack Obama as president of the United States." Clinton said Humphrey taught him to laugh even when times were tough for Democrats. "All my life, I loved and admired Hubert Humphrey. He believed that public service was a noble endeavor," Clinton said. "He believed that his adversaries need not be his enemies. He believed that with a happy heart and an open ear and an honest dialog, a lot of conflicts could be resolved. And he lived his life to do it." In closing the ceremony, former Minnesota Attorney General Hubert "Skip" Humphrey III, read one of his father's favorite quotes from poet Carl Sandberg. "'I see America not in the setting sun in the black night of despair ahead of us. I see America in the crimson light of a rising sun, fresh from the burning, creative hand of God.' To me, that's what Hubert Humphrey, what my father -- what our father, our dad, was all about." In the audience was Joann Tromiczak-Neid, a St. Paul resident who volunteered for Humphrey's campaign. She says his statue is a new sign of hope. "Because Hubert was at the beginning of change in civil rights in our country. And we have some more civil rights that need to come about. And so this is a symbol that it was done before -- we can do it again." Tromiczak-Neid hopes in the years to come the statue will remind people that it's possible for leaders to be people like Hubert Humphrey.